We're Awakening! 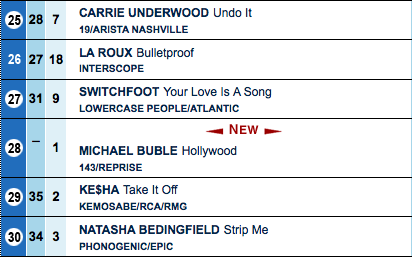 : "Your Love Is a Song" officially enters top 30 of Billboard Adult Pop Songs! "Your Love Is a Song" officially enters top 30 of Billboard Adult Pop Songs! As predicted, "Your Love Is a Song" has entered the top 30 Billboard Adult Pop Songs/Adult Top 40/Hot AC charts! This week, it settles in at No. 27, a 4-spot vault. Meanwhile, "The Sound" holds at No. 7 on Alternative songs. Great job to everyone who has supported the band so far! "Meanwhile, "The Sound" holds as No. 7 on Alternative sons." AWESOME...I live in Lansing, MI I hear "Your Love is a Song" all the time on XM Radio...but haven't heard it yet on regular FMs here---is there any way to find out what stations are playing the song in your market? Matt, I would try to sign up for an account on Allaccess.com. i think it's free, but you can check general market radio station playlists! hope this helps. "Your Love Is a Song" enters Top 30 of Hot AC!